This area within a local housing development offers informal landscaping and recreational facilities. The play area located within the school grounds is designed for supervised children under the age of 8 years. The site has open access and is normally open during school hours. The Nature Reserve is among a number of parks and green spaces that has receive a prestigious Green Flag Award – the mark of a quality park or green space. 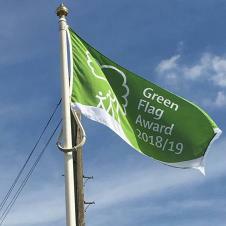 Mrs Jan Martin, Glen Parva Parish Council Chairman said: "We are absolutely delighted to receive a Green Flag Award for a third year from Keep Britain Tidy. This local woodland located within the Glen Parva Local Nature Reserve is a haven for wildlife and provides a network of access to the Great Central Railway Line, Grand Union Canal and other local areas. This playing field provides a valuable amenity for the local community in relation to informal recreation and play equipment. Car parking is avaialble. A memorial garden is located within the playing field which provides the opportunity for quiet reflection. Officially opened in November 2010 this 27 acre plot of land in Glen Parva is home to an array of wild flowers and creatures such as the green woodpecker, meadow pipit, dragonflies, butterflies and voles.